This is a country with a long history of rich culture and independence – and with a great deal of natural beauty within its borders. The shadow side (if the population growth isn’t one already): Ethiopia is almost the poorest of the least developed countries – 4th in the worldwide poverty index of UNDP. One out of three inhabitants lives on less than one dollar a day. Two thirds of adults are illiterate. Less than 30% of the population has access to safe water, less than 50% to simple sanitation like a pit latrine. Check for yourself the major UNDP development indicators for Ethiopia, or the Millenium Goals interim results, there is much to worry about; although several indicators show significant improvement over past years. Cities and regions here: There is Addis Abeba, the capital; and a world on its own. Crowded, noisy, polluted. Other cities in the country are mere villages by comparison. There is the North and the centre, with mountain ranges up to 4500 m, and high plateaus; the equator is near, but the nights are freezing cold. The Northeast is very hot, with its altitude partly below sea level. That part already belongs to the Great Rift Valley, the trough that opens across Eastern Africa where the easternmost part of the continent floats away in the direction of India. The Rift runs in south-westerly direction, beset with interesting lakes. The Southwest is where we are, in the Rift too, in the region called SNNPR. Southern Nations, Nationalities and Peoples Region. Doesn’t that sound like a compromise? Like, I belong to a People, and you belong to a Nation, and yet we have to find a suitable common name for us all? Maybe – but the name expresses rightly that there are a lot of differences here, and it does sound better than ‘region of the many, many ethnic groups’ – however correct that may describe the situation. In this bottom administrative area of Ethiopia, the landscape holds anything from highlands through lowland savannah to desert-like country. In the western part, closest to the Sudan, the Omo river traverses its lowlands, to end in Lake Turkana in Kenya. That is also where some of the most colourful traditional peoples live, with some ethnic groups numbering 120 000 or over, some around 50 000, but others 10 000 or less; one reportedly a mere 1 500. In about the middle of the SNNPR is Arba Minch. A city, because it has a regional function with its great market, two hospitals, a bus terminal, a university (the remote sun-lit buildings in the picture), and even an airport! One runway; two scheduled arrivals and departures a week, of a plane hopping between Addis and here once on Wednesdays and once on Sundays… But a big village really too, as the vast majority of its inhabitants dwell in very simple houses with walls of wood-enforced clay, and with corrugated iron roofs, or with here and there the traditional thatch. Shops are built a bit more sturdy, but are very simply stocked. On your first day in Arba Minch you may not be impressed much with the town and its surroundings, especially not when you arrive at the heat of the mid-day in the dry season when the light is flat. But the beauty of the environment shows when the light changes over the two great lakes in the vicinity, and makes the surrounding mountainous escarpments stand out with their colours and shadows. Daytime temperatures? 30 - 38 C July to March, lowest 20 – 26 C during the rainy season April to June. 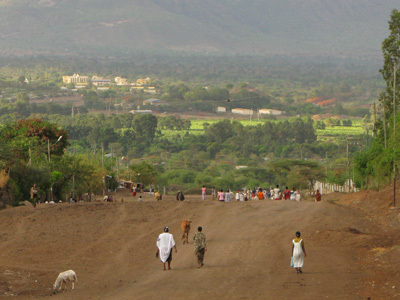 Arba Minch has about 70,000 inhabitants. Grounds are relatively fertile, and the main occupation of its inhabitants is farming in the area around the town. Individually they have a cow or two, which together adds up to an awesome lot of cattle that spends the night in town, and is seen walking out in large herds in the morning and back in the evening, guided by some herdsmen. With the two lakes nearby there is a fishing cooperation, and even a crocodile farm with a small leather facility. A textile factory completes the industrial picture – not really much. 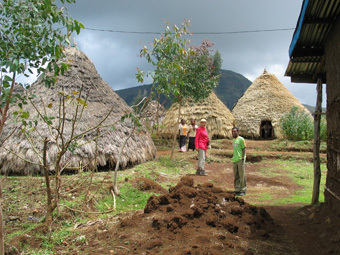 20 km northwest of Arba Minch lies the little village of Zigit Bakole. It is situated in a mountainous and steep area, about 2400 meter above sea level (Arba Minch is at 1200 m, more or less at the bottom of the Rift Valley). Although Zigit is small, it is still a kind of centre for the seventeen sub-villages that it consists of. Since a few years there is a good all-weather road from Arba Minch to Zigit. It steeply winds up against the escarpment and stops at Zigit. A number of private bus services now go to Zigit daily. But the vast mountain area around it is still only reachable on foot from that road, with the exception of a very incidental track that is negotiable by 4-wheel drive only. No lorries, no cars. No electric power supply beyond Zigit, and not very reliable in Zigit, too. People in the area live mainly from agriculture. But with the small and often steep plots of land, cultivation is difficult and soil erosion frequent. Improved farming practices (fertilizers, better crop and vegetables varieties) are not common. Houses are mostly the traditional ‘tukul’, the wood, clay and thatch structures formerly named ‘huts’ by ferenji (foreigners). Research and experience suggest that someone with 4 to 5 years of primary education is more responsive to requirements for change in attitude; like changes in nutrition, health, family planning, farming and other technology – in other words more responsive to development. 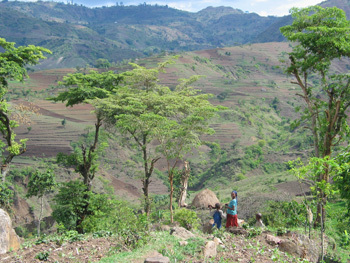 The Sustainable Development and Poverty Reduction Program (SDPRP) of the Ethiopian government lists four priority sectors to develop: education, health, roads, and agriculture and natural resources. Education gets the top attention, as its product should be the necessary skilled and trained manpower for all sectors. There is a specific development plan for the education sector. The global Millennium Goals of ‘achieving universal primary education by 2015’ and ‘eliminating gender disparities in primary and secondary education’ are taken very serious. 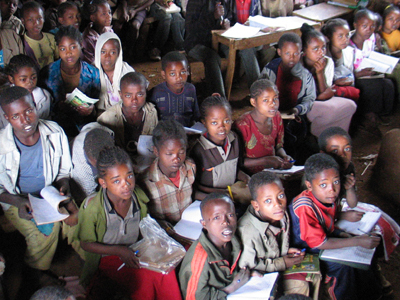 In Ethiopia this means that a large backlog of primary education has to be removed in relatively few years. As a consequence, quantity seems to be more important than quality – at least for now. In recent weeks (March/April 2008) evidence of additional education policy is filtering through, with strong emphasis being placed on creating a large and highly skilled technical engineering workforce. Arba Minch University is rather suddenly tasked for example to grow from its present 8 000 students to 30 000 in four years’ time, with 70% of them in science and engineering. Quantity/quality? Why doesn’t that mean that Zigit Bakole School will be well equipped? The large primary and secondary school in Zigit Bakole that serves not only Zigit but also the surrounding villages has 1400 pupils. Most of them live quite a distance from school; some have to walk 3 - 4 hours a day to get to school and back home. The school serves Grade 1 through Grade 8, with exams at the end of Grade 4 and Grade 8. It comprises of several mud-over-wood buildings with corrugated zinc roofs containing 16 class rooms. Most classes have between 70 and 100 children. Lower grades have over 130. The initial setup of such schools is a central government responsibility. After the start, its operation and further development is transferred to the Kebele, the local administrative unit. The Kebele has a chairman who is elected for a five year period. The government remains in charge of allocating and paying teachers, the number of which is based on the enrolment statistics that the Kebele provides. The government also supplies text books, but in quantities and at times that vary. At best there will be one book per 3 students. Zigit school has only one English book for Grade 8, and that is used by the teacher. Books may arrive mid-way in the school year. In a cycle of varying length they may have to be replaced as the curricula change. But if new classrooms are needed, or new furniture, or other teaching and learning material, or a new living block for teachers (3 by 4 meters per unit) the Kebele must arrange. How is that part of the school funded? For a new financial year the Kebele sets up the budget requirements. 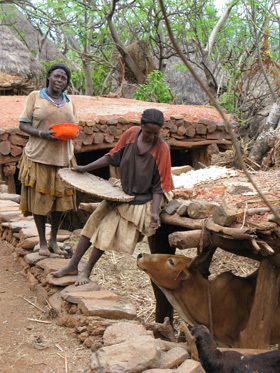 The Zigit Bakole Kebele consists of a hinterland of poor farmers in a subsistence economy. Not much to spend here. 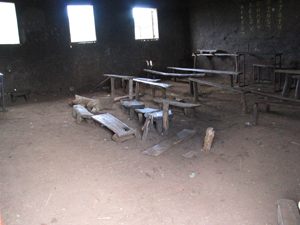 The principle is that every family in the Kebele is expected to contribute a fixed amount per year to the school. For this year, the contribution is set to slightly over USD 2. For families with any number of children in the school this amount is compulsory (once per year per family; not per child). As a result, quite a number of children do not attend school. We are not clear how this construction complies with the government target of free and compulsory education (from age 7 till age 14) and the millennium goal target (‘achieving universal primary education by 2015’). As another result, the required amount for the budget is not reached, and plans for eg new classrooms or furniture cannot be carried out. Some families are so poor that they can not buy the necessary exercise books and pens. For the orphan students of which there are quite a number (due for example to the big HIV-AIDS problems that Ethiopia suffers from) buying materials is also is a big problem. The school has no good furniture since local government over the last years provided only 30 school desks for 90 children (as one desk seats 3 children). The remaining furniture consists of improvised benches on which children can sit but have nowhere to put their books up or write in a proper way. As there even are not enough of these, in many classrooms there are children that have to sit on the mud floor. We visited Zigit a number of times now and have seen how motivated the children and the teachers are to give and receive good education. We felt a desire to help – and as we know other people would be eager to help too, we called upon contributions from others. We discussed with the Headmaster and the Kebele chairman what would in their view be needed most. The furniture came out as most urgent (and we could easily see why) – though another item might soon be the building of more classrooms, to alleviate the pressure on the lower grades. We targeted to help supply 250 desks. With re-use of existing furniture or what remains of it, this will give already quite a workable situation. The work will be carried out by an Arba Minch carpentry association, of which one director is a school teacher himself at the same time. The association is specialized in making these desks, seating three children each, out of metal and wood. A local contact person that we know and who has handled similar projects for a Dutch foundation supports the contacts with this manufacturer, with the transport people (the Kebele will arrange and cover transportation), with the school’s headmaster, and with the Kebele authorities. We would like to help the school also in further necessary stages of its development, like with new classrooms and/or text books – but we have not made any commitments for that yet. We do meanwhile keep in touch with the Kebele to learn more about their planning and budgeting process, their interactions with central government, and so on. Work has started! Over three quarters of the funds for the 250 benches is committed. The carpenters have purchased their first materials following a down payment, and will soon produce the first iron frames. Details of transport are being prepared – the 20 kilometers up the escarpment will need to be travelled a number of times by a lorry. To pack the desks more economically and reduce the number of journeys, the final assembly of wood on the metal frames will be carried out in Zigit by the carpenters. You will find here a few pictures to peruse.